You can see the images used here on my Pinterest board here for all the original photos. Let me know your thoughts. Are you loving the ombre as much as I am? Notice it on the cake AND and on the flowers on the right hand side. PS Have you liked me on Facebook yet? Click HERE now! Sooo I’m pretty excited about this but my wedding dress (a gharara) from Pakistan got in 2 weeks ago! I ordered it based off a photo, and the colors are spot on and look incredibly beautiful. That was my biggest nightmare…. the colors looking off and not good. Thankfully, the colors are JUST what I wanted and I could not be happier. I just don’t know what to do about a couple of things on the outfit. I’ve only shown it to like three people, and they all like it, but I’m having issues with the top. I think it needs more embroidery. I don’t know… I just told my mom and she just told me that she doesn’t want to send it back. I don’t know what to do!! We spent a lot of money and I don’t think it’s BAD, it is just NOT what I expected. I had a different idea in mind for the embroidery on the top and the photo reflected that too… but the outfit doesn’t have it. Those are the risks you take when you order based on a photo. I just realized that we spent as much as I probably would have ordering directly from another designer. Maybe I’m just stressing, and don’t get me wrong, I LOVE my outfit. I really truly do. Just not sure what to do. Oh also! My dress for the Macedonian event is ready!!! YAY! I have to pick it up this weekend. Clown bride… that’s what I think of when I think of Pakistani brides of the past. I cannot believe what so-called makeup artists would make gorgeous Pakistani girls look like on their wedding days. For Western brides, the tradition is “less is more” and brides choose to go for an “enhanced” look of themselves. Now I don’t think that correlates at all to the beauty, intricacy, and boldness of a Pakistani bride. Beautiful faces with done up eyes, bold lips and softly blushed cheeks are essential to Pakistani brides…we have intricate outfits, heavy jewelry, having a bare face just makes the look incomplete! I just barely began to schedule my makeup trials (soo essential brides!) and I’m looking to Pakistani fashion sites for inspiration…I’ve been looking at the posh new Pakistani salons back in Karachi to see what the new trends in makeup are. 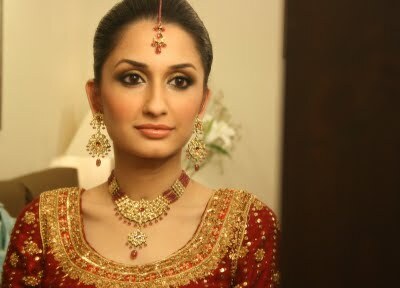 Here’s a picture from the amazing Bina Khan who is arguably the best makeup artist in Karachi…. she made this little Pakistani bride look so pretty… look at her eyes and her glowing skin and her soft lips! Not to mention how beautiful the embroidery on her dress is and the jewelry! Everything on here is simple yet she really looks beautiful. I’m going to take this photo to my trials because her skin tone matches mine more than the other models I see posted on these websites! I can definitely do without the bright pink lips but I love how her eyes pop. Now this below is definitely something I’m going to take to my trials too… her face looks really clean, love her eyes, and her lips are not too shiny but they look good. I included a photo where she’s looking down so you can really appreciate her eyes. I love that she chose the accents of her dress (green) as her eyeshadow color rather than use red or gold eyeshadow which is really typical of Pakistani brides…. really unique and looks amazing on her. Anyway, just some photos of Pakistani brides. And for all my non-Pakistani friends, hope this gives you a glimpse of how my wedding will be! *Yup, we have our veil (called dupattas) draped like that… and yes its usually made of silk and is really heavily embroidered. There’s a whole blog post about that coming, because draping a dupatta is really an art! *And yessss we wear that much makeup and love getting dolled up for our weddings! There is no such thing as “natural makeup”… but thankfully more modern Pakistani brides have kept the outrageous makeup of days past under control a bit! -Get a trial! Usually these are discounted over the normal rates they charge, and some places even give them to you for free if you pay in full for you wedding on that date. -Take pictures after your trial so that your makeup teams remembers how they did your makeup for your big day! -Oscar Naranjo at Ziba Beauty. He’s infamous in the South Asian bridal community, the first name that comes to mind when they discuss makeup artists. -Jeannie Jeffries at Couture Beauty Team. 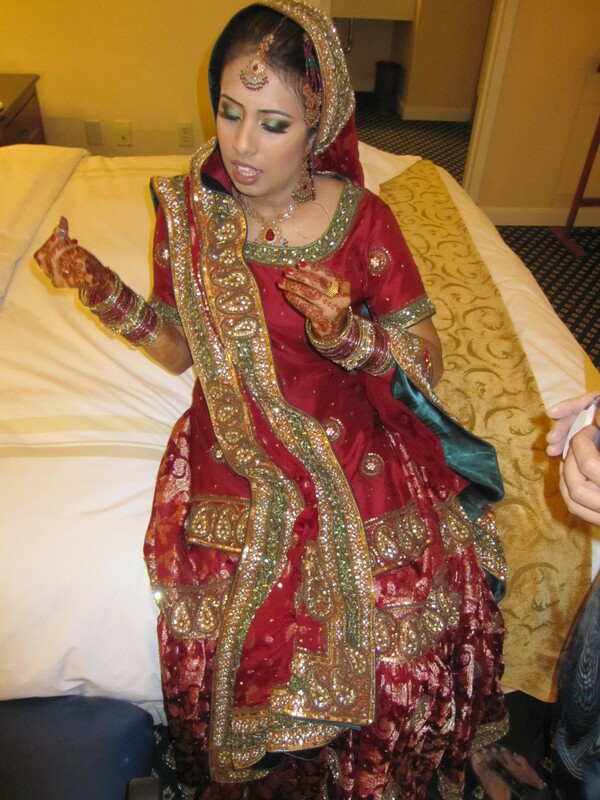 She specializes in South Asian bridal and does an incredible job. She’s a little more subtle than Oscar I hear. –Monique Powers whom I met at a South Asian bridal show. She’s certified by Here Comes the Guide and does a really good job–uses airbrushing! –Flawless Faces in Costa Mesa— amazing girls who post photos periodically on their blog, enough photos to show me that they definitely can create the dramatic and beautiful look I’m going for. And yes, you’ll see Gretchen from the Real Housewives of Orange County‘s photos are on there periodically because apparently this place is her preferred makeup spot! nice. Anyway, so those are the top four places I’m visiting for my makeup… always looking for suggestions! Engaged? Congratulations! 5 Next Steps You Should Take!